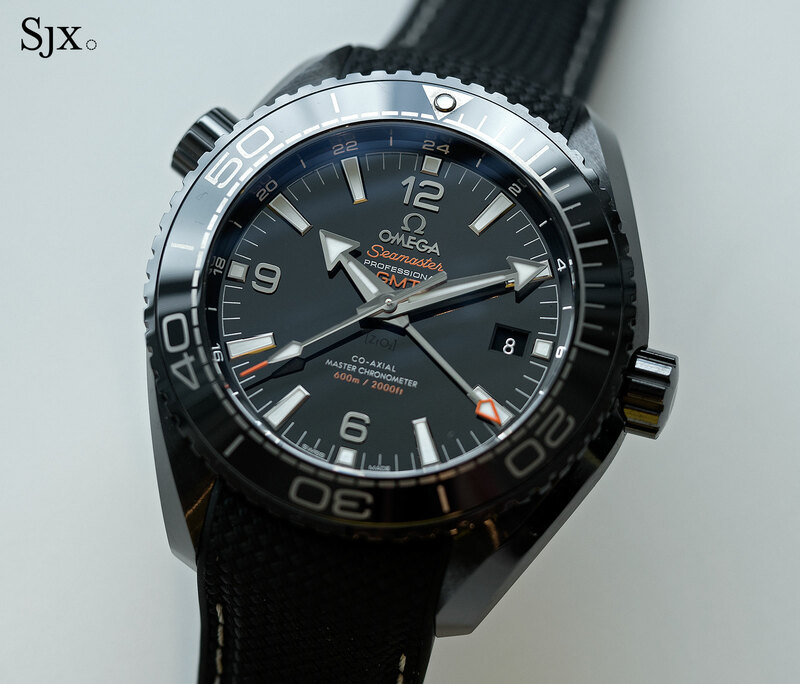 SJX examines Omega's new top of the line dive watch, fully spec'd inside and out. 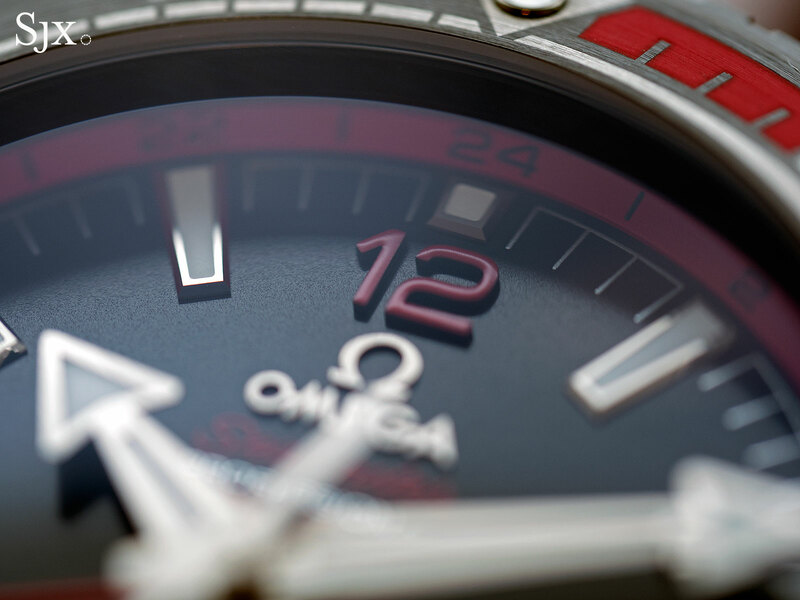 Over the last decade Omega has steadily developed new features to improve its watches, ranging from the Co-Axial escapement deep inside the movement to the ceramic case that made its debut on the Speedmaster Dark Side of the Moon. 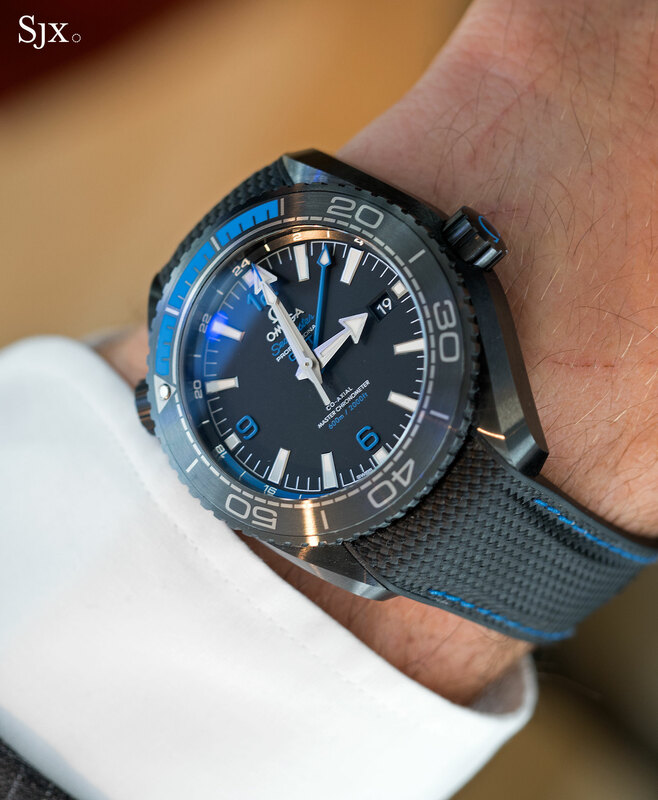 The Seamaster Planet Ocean Deep Black combines all of those innovations in a single watch, resulting in an impressively featured, albeit pricey, timepiece. Four versions of the Deep Black are available, all sharing the same fundamental features. The top of the line is the Deep Black with accents in 18k Sedna gold, Omega’s proprietary red gold alloy that does not fade over time. The other three are all ceramic, with various colour accents, and priced the same. 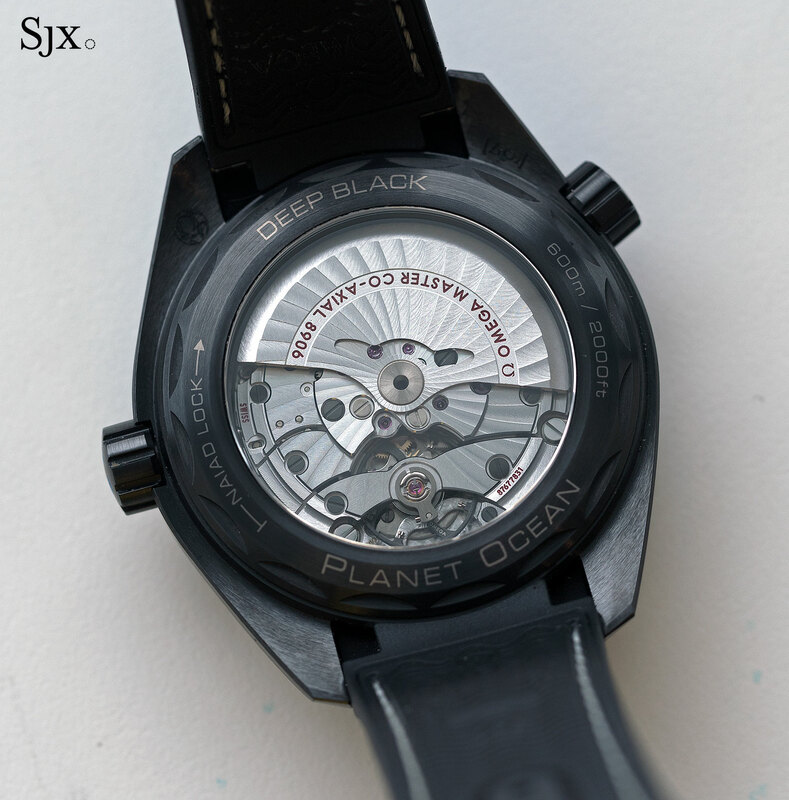 Made entirely of precisely finished black ceramic, the Deep Black case is large and hefty, being 45.5mm in diameter. 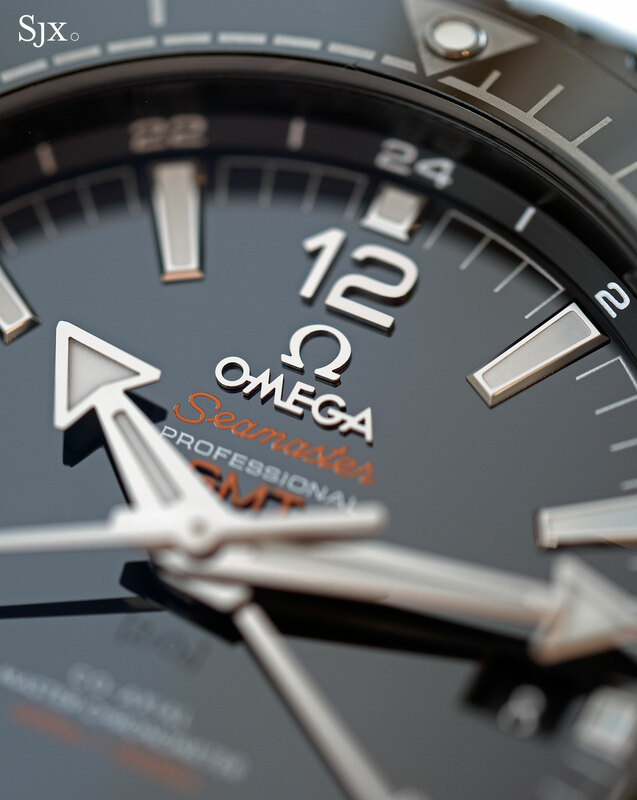 The style is typical of Omega, with “lyre” lugs that are fortunately short, allowing it to fit on smaller wrists. 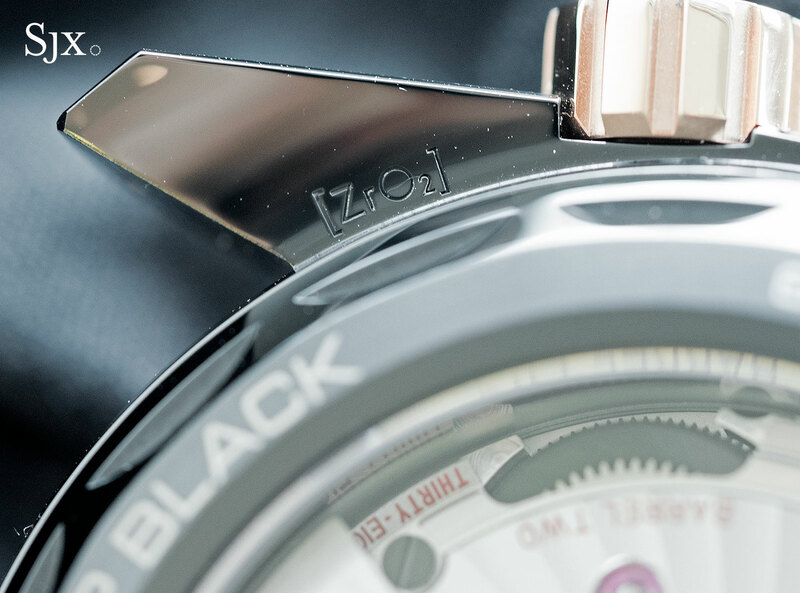 The case finishing is entirely brushed and matte on the red and blue versions of the Deep Black, but alternates between brushed and mirror polished on the rose gold and black models. The latter is significantly more attractive, given the contrast between the two surface finishes, especially the polished bevel along the length of the lugs. But more interesting than the case material is the case back, which is screw-down. 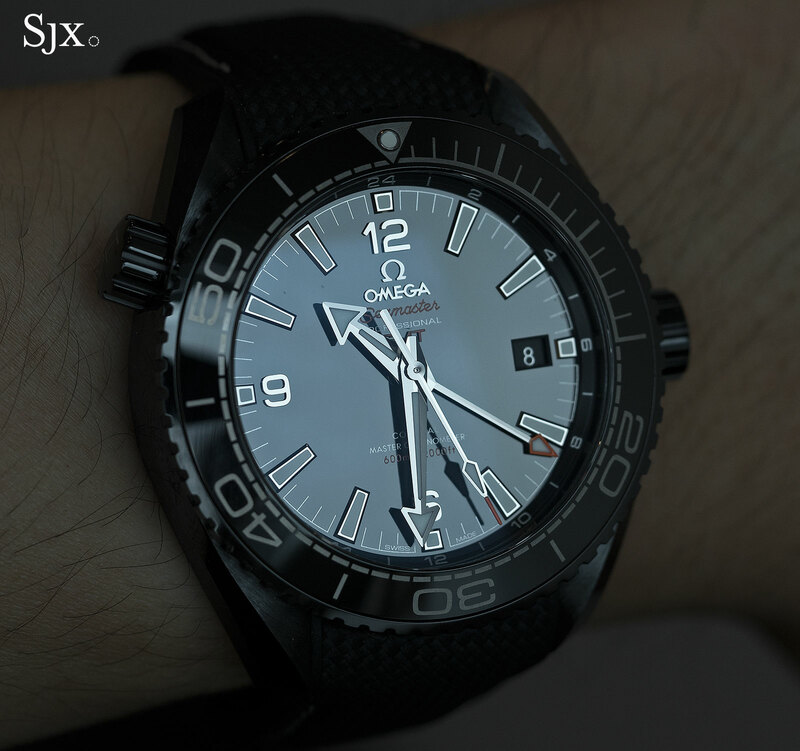 This is the first wristwatch with a screw-down back made of ceramic that screws into a ceramic case, a feature Omega has named Naiad Lock, after the water nymphs in Greek mythology. “ZrO2” is the chemical formula for zirconium dioxide, the type of ceramic used in the Deep Black. 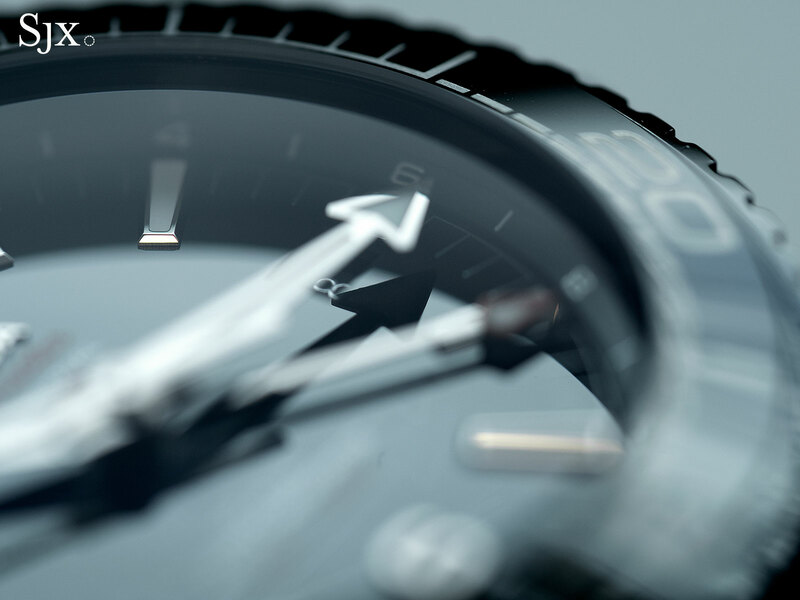 Typically case backs of ceramic watches are either ceramic and secured with adhesive, essentially glued onto the case, or made of metal and then screwed into a metal tube inside the ceramic case. The reason for that is that the hardness and brittleness of ceramic means that the material tends to crack when force is exerted, making a screw-down back a no-go. 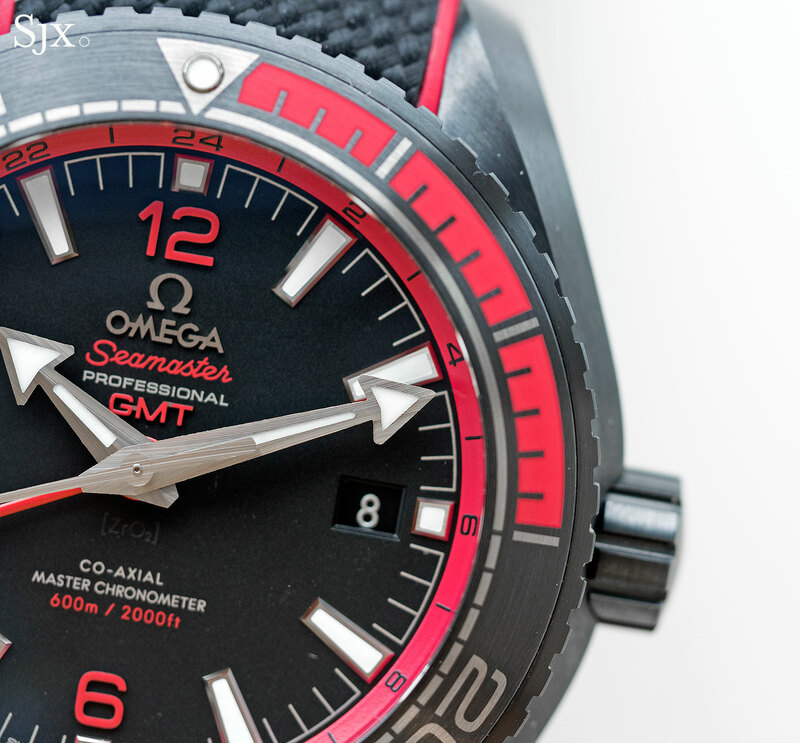 But the particular ceramic Omega uses for the Deep Black is slightly elastic, making the Naiad Lock screw-down back possible. Both the back and case feature large, wave-like teeth that lock against each other when the back is tightened, compressing the rubber gasket in-between to ensure water-resistance. 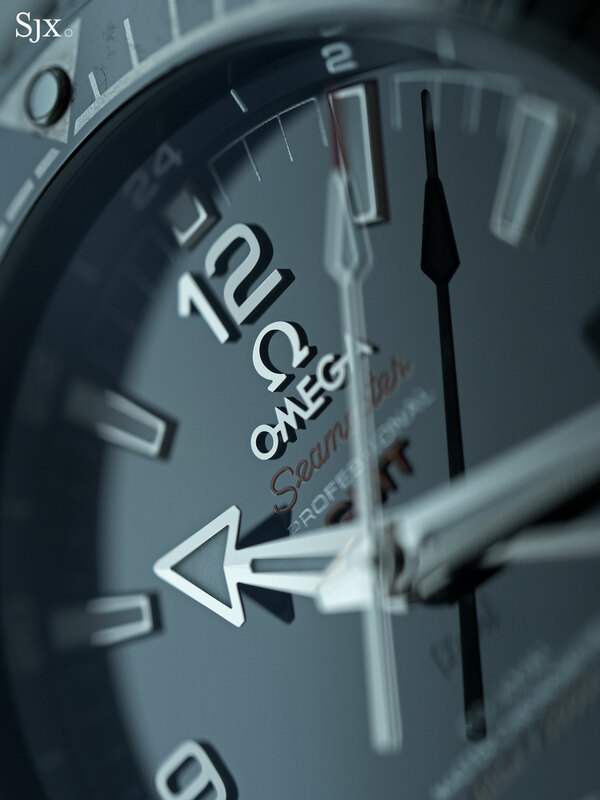 The screw-down back also operates like a bayonet lock, so the Omega logo and lettering are always correctly aligned and read horizontally. 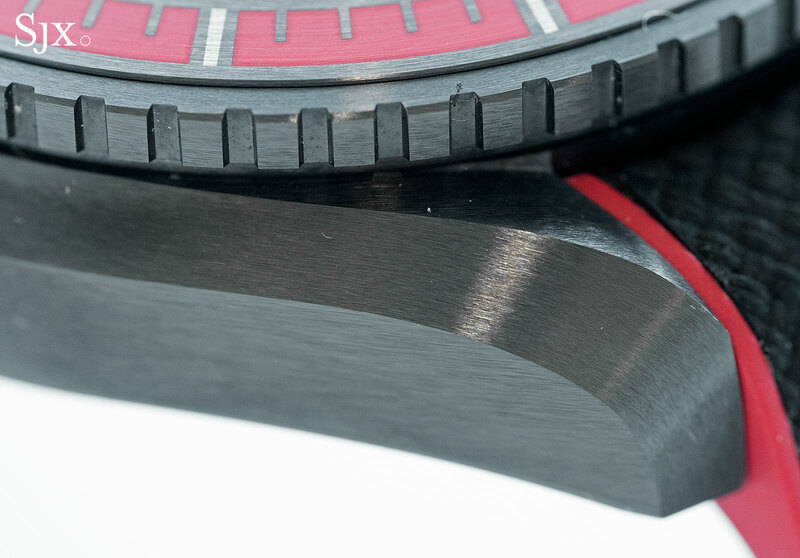 And on the blue and red models, the Liquidmetal markings are joined by injected rubber to match the dial. 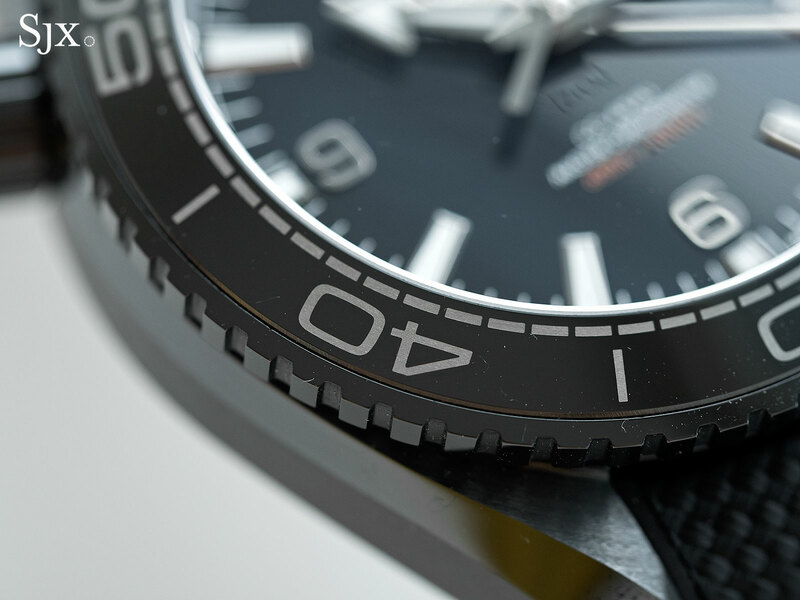 While the longevity of rubber is a concern – the material doesn’t have the robustness of ceramic for instance – Omega states with certainty that the rubber inlaid bezel has been age tested to the equivalent of years and years with no visible wear. 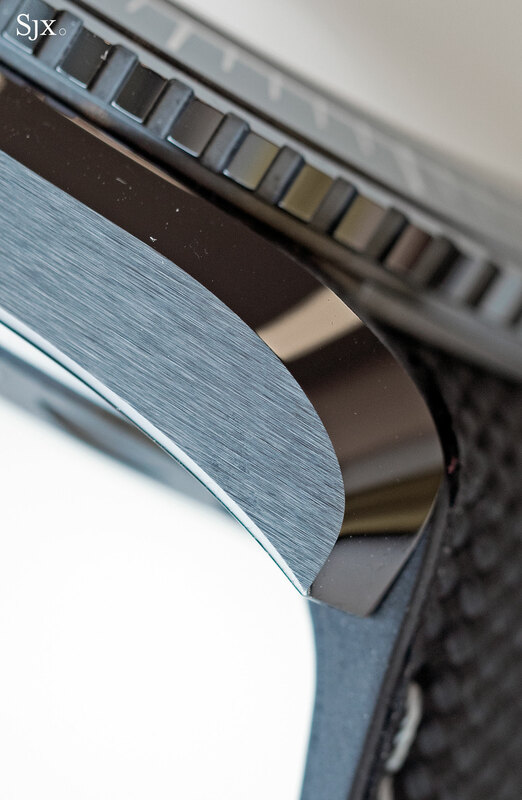 The injected rubber inlay is perfectly flush with the bezel and almost impossible distinguish by tactile feel. 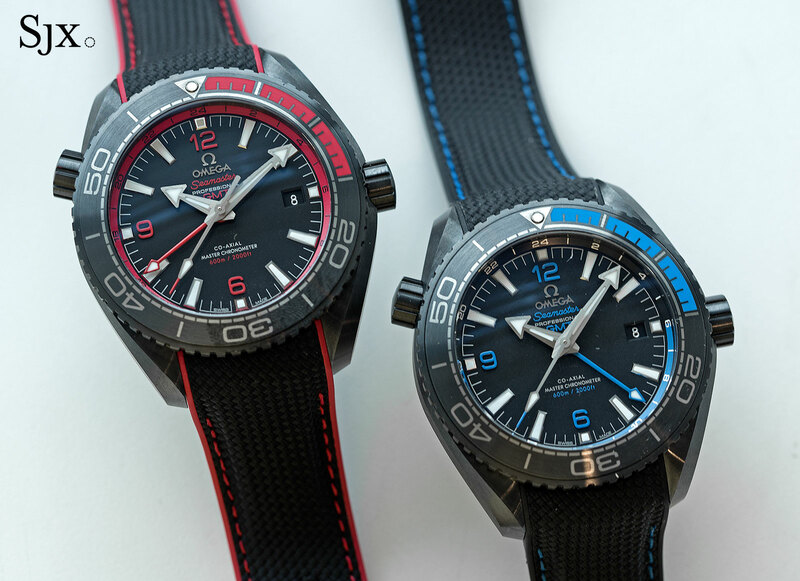 The use of ceramic continues on the dial with the entire dial being a disc of ceramic – mirror polished and exceptionally glossy on the black and Sedna gold models, and a no-nonsense, matte black on the red and blue versions. 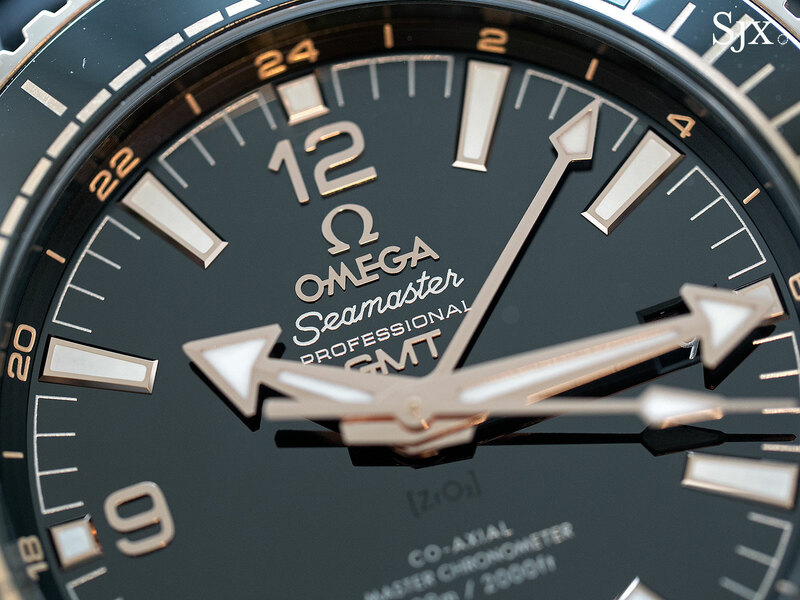 Up close the dial reveals itself to be extremely well executed, with expensive detailing – the hands and hour markers are all 18k gold – and precise printing. 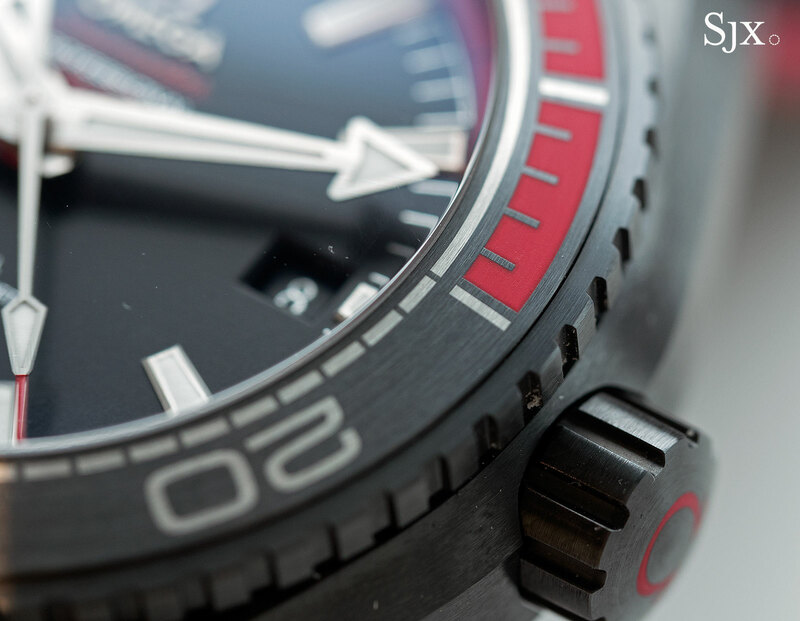 The matte ceramic dial of the Deep Black in red. 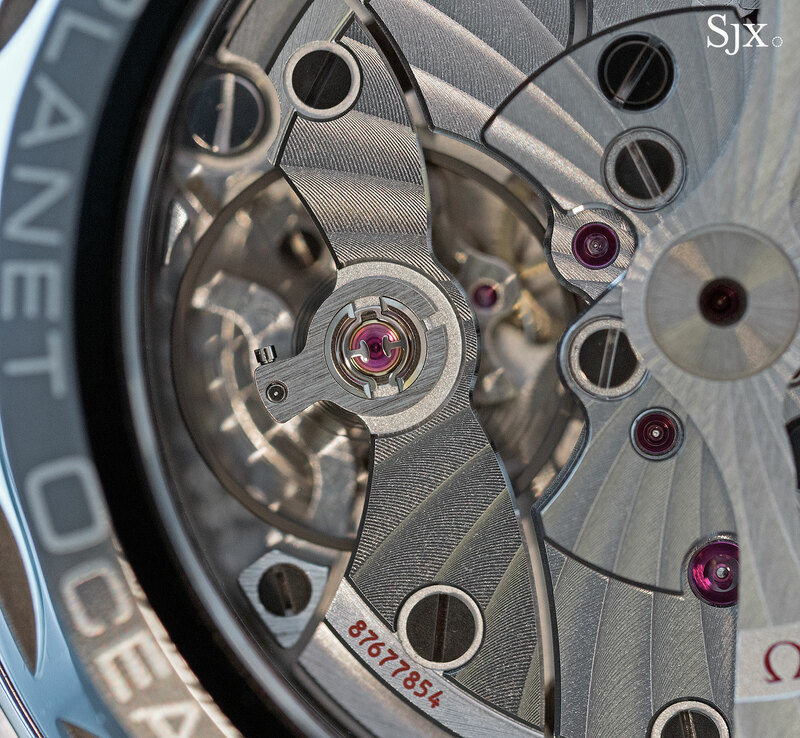 High-tech manufacturing is amply demonstrated inside the movement as well. 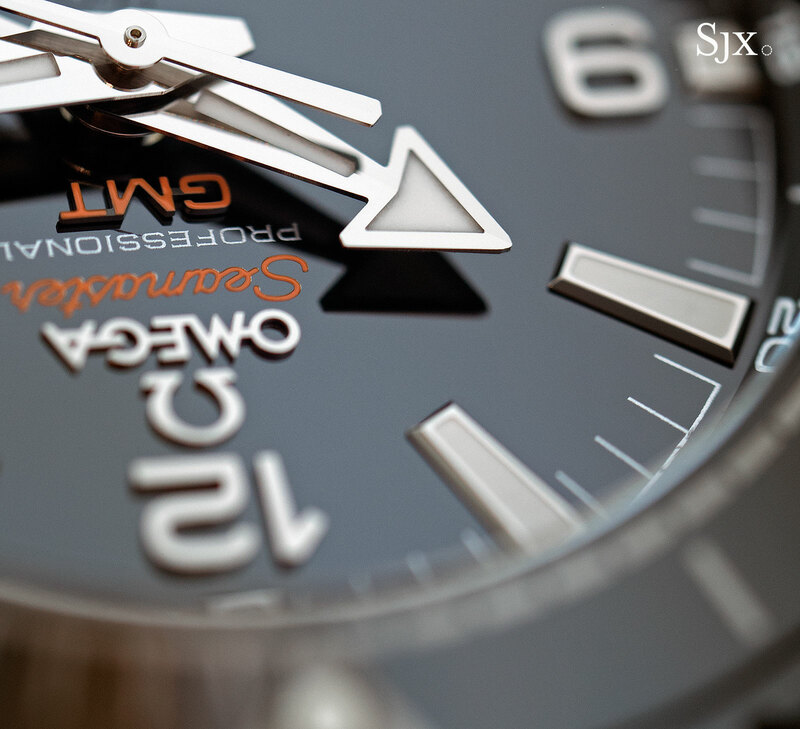 The calibre 8906 is a Master Co-Axial Chronometer, produced at a dedicated facility and rigorously rested by the Swiss government’s weights and measures agency. High-tech with no pretence at being artisanal, the calibre 8906 is automatic with a second time zone function set via the crown – making it a straightforward dual time zone wristwatch. 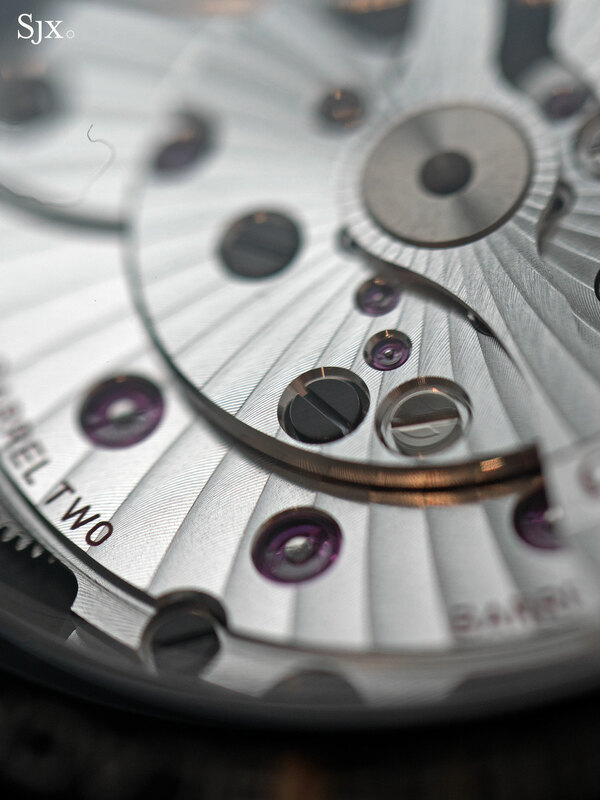 More interesting than the functions are the technical details of the movement, which has both George Daniels’ friction-free escapement as well as Omega’s unique magnetism-resistance. The bridges are finished with spiral Cotes Arabesque damascening that Omega applies to all its high-end movements. Thanks to patented alloys used for certain vital components in the escapement as well as a silicon hairspring, the movement’s magnetism resistance exceeds 15,000 Gauss, more than the strength of a small neodymium magnet and not far off from the 20,000 Gauss generated by an MRI machine. All four versions of the Deep Black are fitted with rubber straps featuring a newly developed antibacterial coating, prevent them from getting mouldy or smelly after prolonged use. 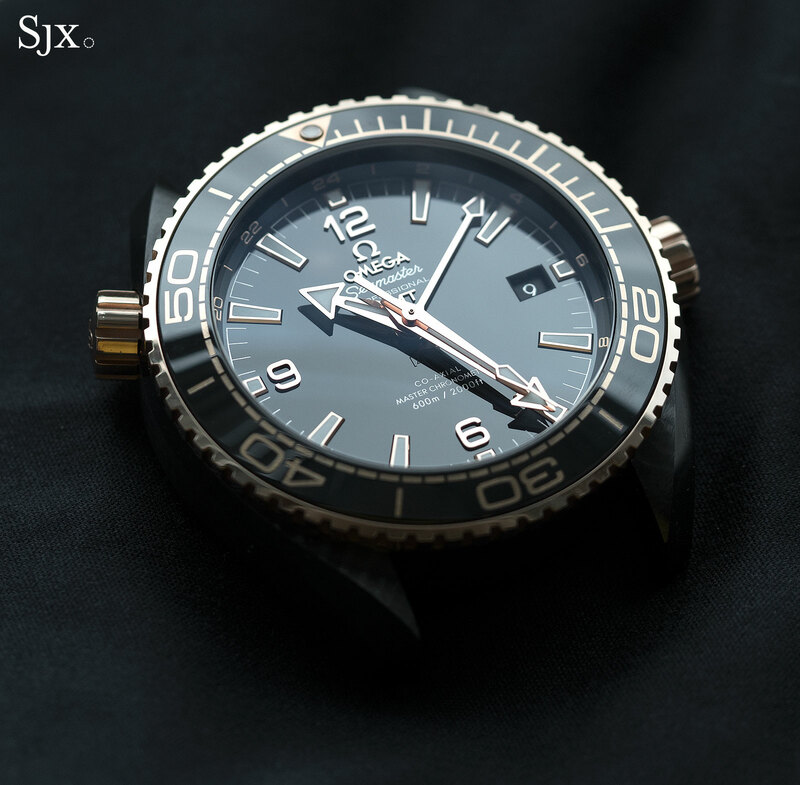 While the Sedna gold model has alligator on top of the rubber, the other three have a fabric upper. 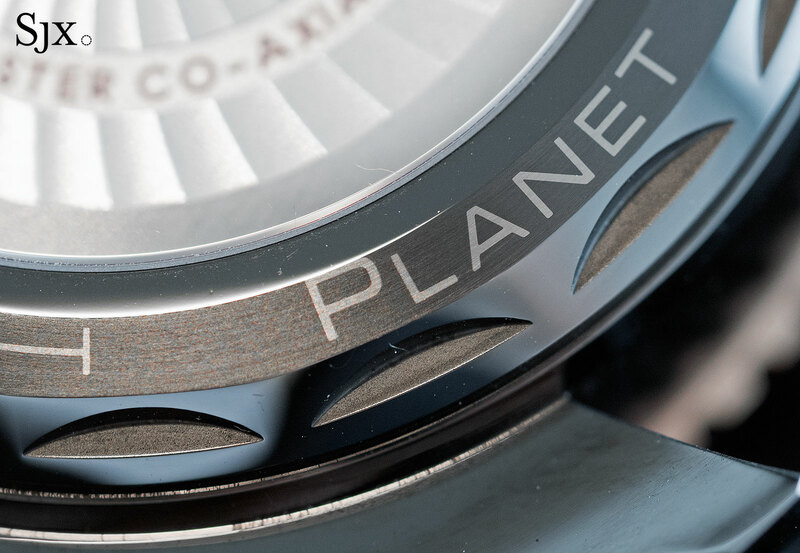 All of these formidable features come at a sizeable price, with the basic Deep Black priced almost the same as the Dark Side of the Moon, which is a more complicated watch. 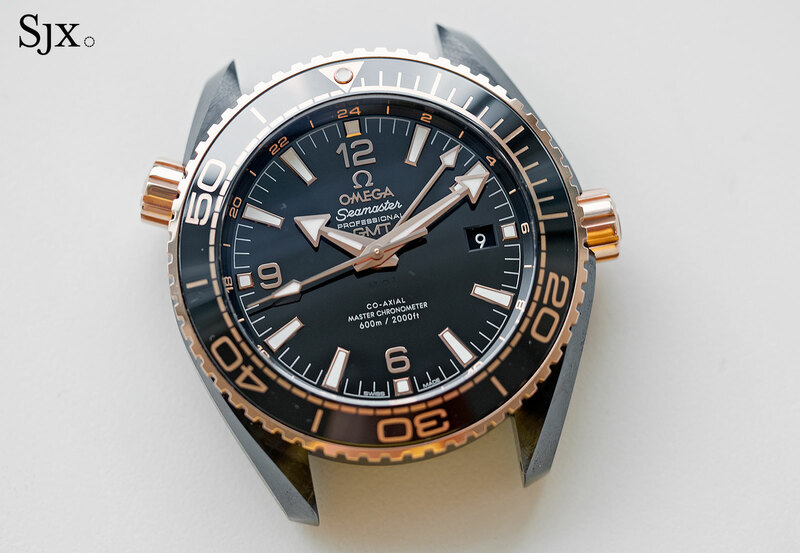 That makes it hard to swallow, given that functionally identical second time zone watches from Omega’s rivals are priced at significantly less. But none of the alternatives have as many features and innovations as the Deep Black. 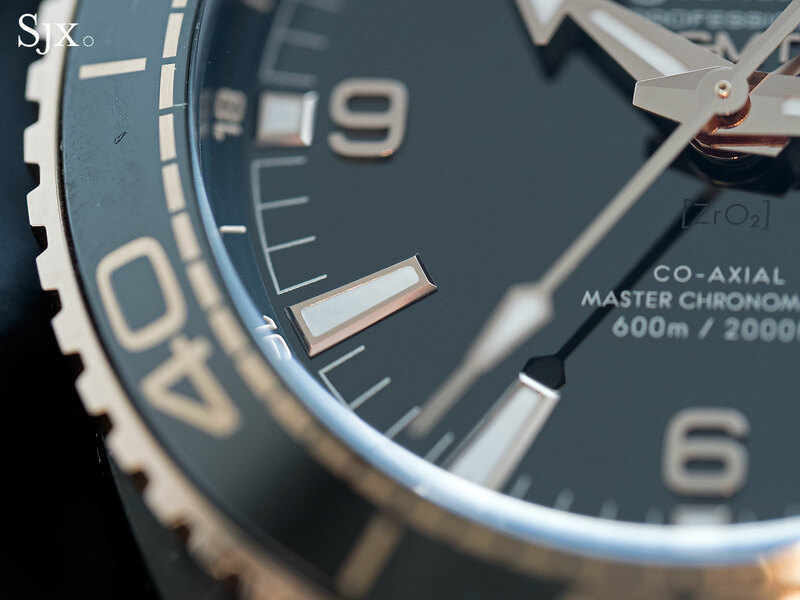 So the Deep Black is the sort of watch that appeals to those, and there aren’t many, who appreciate and understand its long list of notable features. 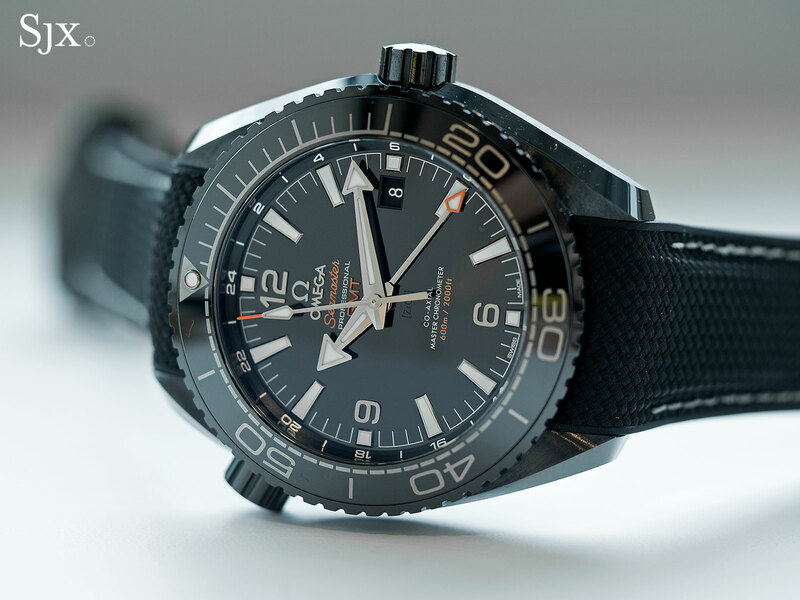 Omega's very first dive watch with a black ceramic case, the Seamaster Planet Ocean Deep Black also boasts a second time zone function.